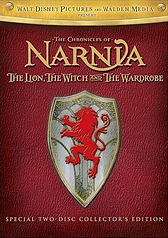 Insert the second disc of the DVD set in your player and on the Main Menu select the entry 'Creating Narnia.' On the following menu page select 'Evolution Of An Epic' and on the subsequent submenu highlight the menu entry 'Anatomy Of A Scene: The Melting River.' Now, press the 'Left' arrow key on your remote control and an icon will appear on the director's chair. Press the 'Enter' key now and you will see a clip of actor Skandar Keynes talking about the film's Turkish Delight. Now go back to the disc's Main Menu and select 'Creatures, Lands & Legends' and then go to the 'Creatures Of The World' section. Here select the wardrobe icon that is found underneath the 'Centaur' menu entry. Press 'Enter' and the menu will 'transport' you into the 'Creating Creatures' area of the Narnia section. Select the wardrobe again to return to the 'Creatures Of The World' section. On the first disc where the Main Menu is ,press up and the border of the Lion's Crest Highlights,press enter and you can view the same landscape without the Main Menu Border.